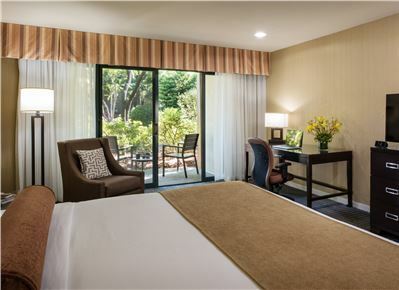 Nestled along the peaceful Matadero Creek, the Creekside Inn - A Greystone Hotel delivers a relaxing Palo Alto lodging experience for business and leisure travelers. Relax with no hidden fees and work in our 136 well-appointed guest rooms and suites in a beautiful garden setting. 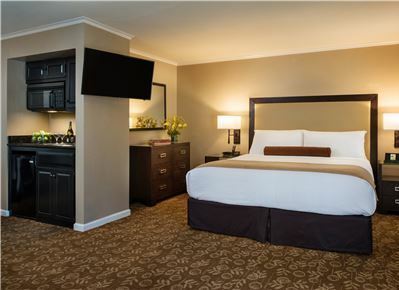 Our charming Palo Alto lodging offers quiet, spacious accommodations that are the perfect home away from home in Palo Alto for business and vacation. The Creekside Inn - A Greystone Hotel's goal is to ensure that individuals with disabilities can make reservations for accessible guest rooms, including reservations made by telephone, in-person or by using the Book Now feature on this web site, during the same hours and in a substantially similar manner as individuals who do not need accessible rooms. The Creekside Inn - A Greystone Hotel has taken steps to ensure that our web site, including our web site's reservations mechanism, is accessible to individuals with disabilities. If you have any questions, you can call our Reservation Specialist at 650-493-2411 or email guest@creekside-inn.com. We are happy to make special arrangements for you, and some advance notice will help us have everything ready! 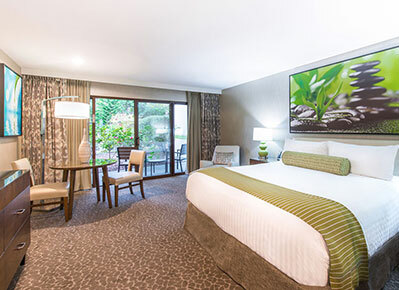 Standard Rooms offer modern lifestyle amenities, including fine linens, eco-bath products, Wi-Fi, microwave, flat-screen TVs, desk, voicemail and plush bathrobes. 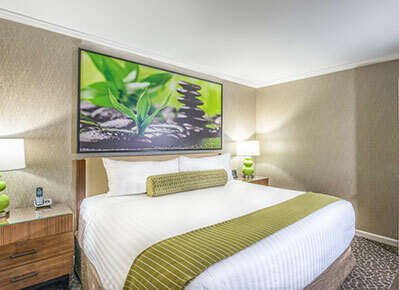 Superior Rooms offer modern lifestyle amenities, including fine linens, eco-bath products, Wi-Fi, microwave, flat-screen TVs, desk, voicemail and plush bathrobes. Deluxe Rooms offer modern lifestyle amenities, including fine linens, eco-bath products, Wi-Fi, microwave, flat-screen TVs, desk, voicemail and plush bathrobes. Our Junior suites feature cozy sitting areas and kitchenettes with a refrigerator, microwave, stove, utensils, pots and pans for extended stays, families and business meetings. Our 1 bedroom Palo Alto suites feature cozy sitting areas and kitchenettes with a refrigerator, microwave, stove, utensils, pots and pans for extended stays, families and business meetings. 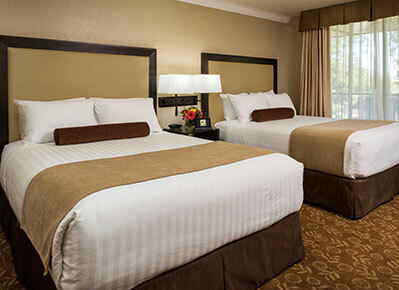 ADA Accessible Rooms are available for guests on a "First Sell" basis. 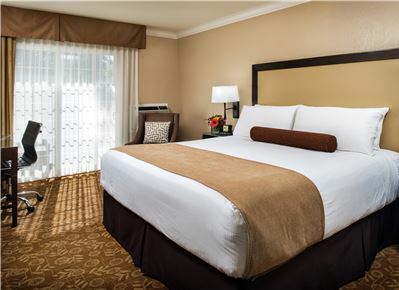 Guests looking to book an ADA Accessible Room can do-so by clicking "BOOK NOW" below, selecting desired Check In and Check Out Dates, and "View by Room." Available ADA rooms for those dates will be available for booking. If an ADA Room does not show up after selecting dates, the hotel is sold out for those dates. Guests requiring ADA accommodations can call 650-493-2411 anytime for more information or assistance. *The Creekside Inn - A Greystone Hotel accepts reservations and will rent rooms and other facilities to persons under the age of 18 in cases where either (i) a parent or legal guardian guarantees payment of all charges for rooms, food and beverage, incidentals and damages incurred, or (ii) a person under the age of 18 is legally emancipated and can present documentation at check in showing they are emancipated and can legally contract for services.